The Pyridine Nucleotide Coenzymes provides a comprehensive discussion of the evolution, properties, and reactions of pyridine nucleotide coenzymes. The pyridine nucleotide coenzymes, NAD and NADP, appear to be among the most versatile of molecules with respect to their biological functions. In addition to their well-documented roles in a large number of oxidation-reduction reactions, these coenzymes are involved in many aspects of metabolic regulation. 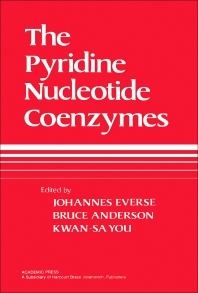 The book begins by tracing the evolution of coenzymes and pyridine nucleotide coenzymes. This is followed by separate chapters that deal with the static and dynamic properties of the pyridine nucleotide coenzymes; chemistry and solution conformation of the pyridine coenzymes; pyridine nucleotide analogs; and the three-dimensional structures of pyridine nucleotide binding enzymes. Subsequent chapters cover the synthesis and characterization of immobilized coenzymes and derivatives and their applications in affinity chromatography and enzyme reactors; the pathways to quinolinate, a major precursor of pyridine nucleotides; the role of pyridine nucleotides in phagocytosis; and non-oxidation-reduction reactions of pyridine nucleotides. School of Medicine, Texas Tech University Health Science Center, Lubbock, U.S.A.